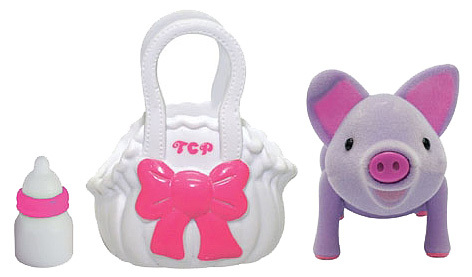 Introduced to the UK in Spring 2011, Teacup Piggies from Tomy are based on the fashionable trend by celebrities to have their very own micro-pig that can be carried in a basket or bag. With miniature electronics hidden inside each one, the Teacup Piggies not only giggle and 'oink', but also speak 25 different phrases! The Piggies themselves are supplied in a variety of different colours and teacups, and girls will have lots of fun swapping them with their friends to get the colour combination that’s just right for them. 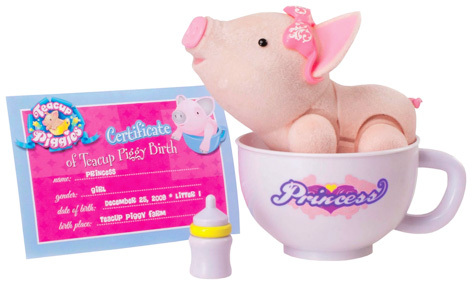 In addition, each Teacup Piggie toy has its own individual personality, as well as a feeding bottle and birth certificate. 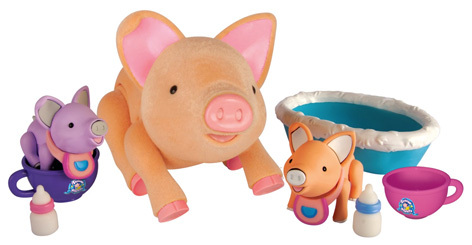 By popular demand... Tomy are now introducing Teacup Piggies Piglets! Even smaller than the original piggies, these cute little piglets are suitable for girls aged six and over. With six piglets to collect in the initial range, each comes with its own carry bag and collar. The Piglets are great fun by themselves - but even better when played with together! This is when Tomy's Teacup Piglets Bedtime Set comes into its own. Featuring two piglets plus miniature milk bottles, bibs and teacups, this set is the perfect place for your little piglets to bed down for a good night's kip.